It's to the point where I don't usually run games (and I run a lot of games) that require important dice rolls. My main game uses playing cards. I also no longer bring my own dice to games because it has been determined they will fail. There's an 80% chance that someone else's dice will also fail for me. But it's better than the 97% chance of my mine failing. So I use other people's. But other people won't let me use the dice they like because they know Kate luck will rub off on them. 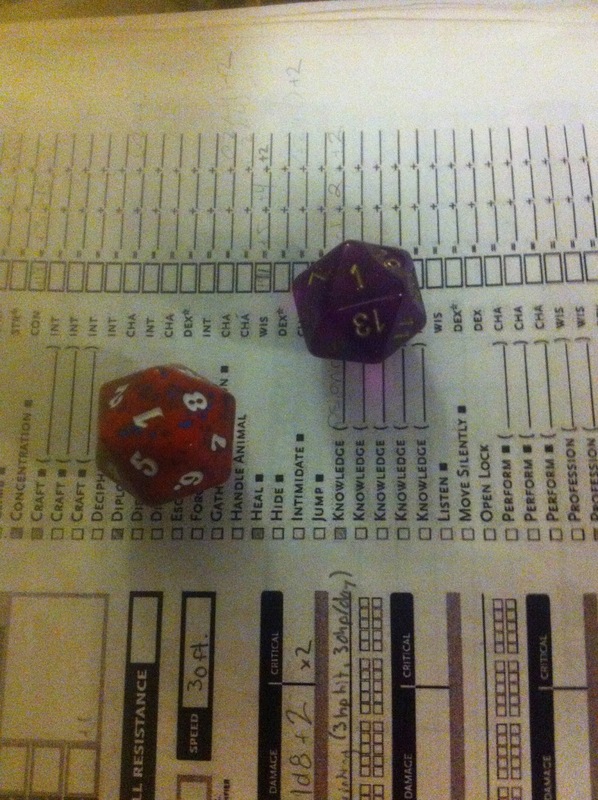 In fact, I don't play characters that require a lot of dice rolls. In the last few years I've relegated myself to magic users, psions, and healers because they don't need to roll to hit that often. And if they do, it's usually a touch attack and that's low. So there's a good chance I may be able to do it, but still, I often fail at touch attacks. My stats are deplorable and my GM keeps making me roll for them, and I'm sure it's because it's funny. Genuinely hilarious. Which gives me good role playing opportunities, but honestly, sometimes I just want to play a hero. I've given up on this dream though. My dice determine I will never be a hero. Some dreams are just meant to be shelved. So with my confessions of a crappy dice roller, I have to ask, at what point does a person let the personal anxiety of dice rolling win? At what point do I throw in the towel, stand up, shake my fist in the air and declare I will never use dice again?